Goat House Escape info about the game-Games2Rule. 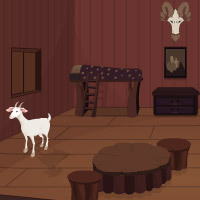 Goat House Escape is another type of point and click new escape game developed by Games2rule.com. In this game a goat is trapped inside his house. The house is full of goat�s materials and accessories. The goat forgot everything and don�t know how to come out from the house. Help the goat to come out from its own house. Use your escaping skill to solve the puzzle and find the useful objects to escape the goat from the goat house. Good luck have a fun play free games.